We are committed to the religious, moral and social development of each child, no matter what their belief or background. Children follow a broadly Christian based curriculum (largely comprised from resources prepared by the Belfast Board some years ago, and the more general aspects of the Catholic teaching aid ‘Alive-O’) which includes Bible Stories, the life of Jesus and moral studies. Children follow the Catholic Church’s ‘Alive-O’ programme of instruction, reflection and preparation. The teachers work alongside parents and Father McKenna to prepare the children for First Confession in P3, First Communion in P4 and Confirmation in P7. 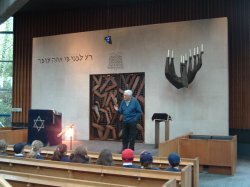 Classes spend one term each year studying a programme designed by staff to challenge negative attitudes, values and practices in society and inform children of world faiths. The children will address prejudice and bias issues like disability, colour, race and culture in a sensitive, age-related and thought provoking way. 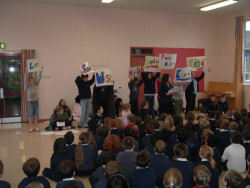 They also learn about Christianity, Taoism and the NI Chinese Community, Hinduism, Sikhism, Buddhism, Judaism and Islam. This is scheme has been running well for several years, but will be subject to review as parts of the RE curriculum overlap with PDMU (Personal Development and Mutual Understanding) and it may need some restructuring. We’ll keep you posted! 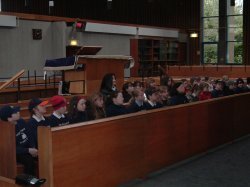 Below are two photographs from P6's visit to the Belfast Synagogue in January 2007. The very helpful gentleman giving us the tour is Cyril Rosenburg. He gave us a lot of information and showed us round in some detail -a fascinating morning!